Our own Steve Tyminski gives us a rundown of his thoughts on last week's Nintendo Switch unveiling and presentation. Before the presentation for the Nintendo Switch even started I was having a tough time getting the presentation to load on the Wii U. It could have been that the Wii U knows its time is up and was misbehaving out of spite. All joking aside, fans of Nintendo should be excited for the Switch and by the looks of all the internet chatter pertaining to the system, there’s plenty of positive buzz. Everyone wanted the release date, price, and the affirmation that The Legend of Zelda: Breath of the Wild was going to be a launch title. As it turns out, we got all those things and more. The Nintendo Switch will be releasing on March 3, 2017, much earlier than anticipated. But what about the price? Rumors had been targeting around $250 and $300. The actual retail price (I feel like Bob Barker a bit here) is $299.99. For brand new systems in the current gaming client, that isn’t too bad. Especially since the Switch has been confirmed to be region-free, something fans of Nintendo have been clamoring for since what feels like the dawn of time. There were a deluge of great-looking games revealed for the Switch, too. Its main launch title will be the Legend of Zelda: Breath of the Wild. The new trailer showed off how gorgeous the game looks as well as the voice acting, uncharted territory for the Zelda franchise. Hopefully, adding voices to the franchise won’t ruin band by the sounds of the trailer, the franchise will be just fine. Another neat looking game released during the presentation was Arms. Arms reminded me of Wii Sports Boxing in the way punches were thrown as well as maneuvering around the fighting area. Your character fights with your fists and springs attached to those fists. There’s going to be online matches available but with Nintendo bringing out their new online service, who knows how much play the online modes of games will get. Splatoon 2 and Super Mario Odyssey were two more games revealed for the Switch. These two games won’t be part of the launch-day lineup with Splatoon 2 coming in the summer and Super Mario Odyssey coming out for the holidays. It feels like such a long time to wait for Super Mario but fans will have to persevere. Long story short, the plumber finds himself in new worlds in his return to the “exploring the surroundings” or sand box type game. 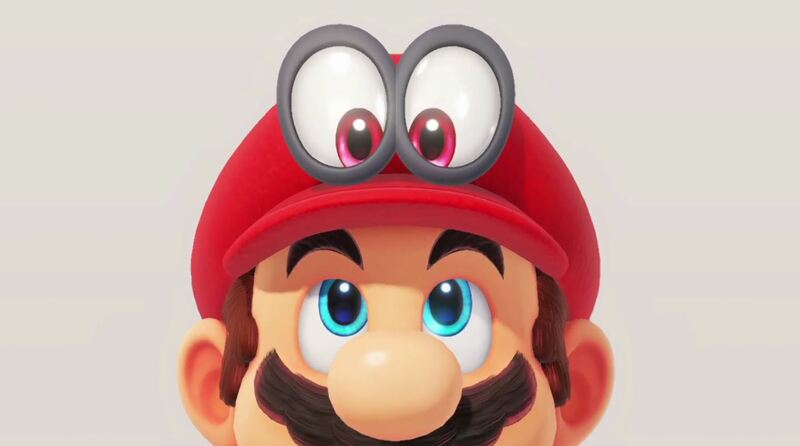 Somehow Mario’s hat undergoes a transformation and has eyes on it and really who knows what’s in store for that mechanic. Splatoon 2 will bring plenty of new to the table in terms of new stages, new weapons, and new strategies to use. As mentioned before, expect to get your hands on Splatoon 2 in the summer, a perfect time to swim with the squids! Some minor highlights from the presentation were Skyrim finally coming to a Nintendo system, FIFA coming to the Switch and EA appearing to be back on decent terms with Nintendo, a No More Heroes sequel in development just to name a few. It wasn’t until after the presentation that Nintendo released trailers for Mario Kart 8 Deluxe, Super Bomberman R, and Sonic Mania. By the looks of what Nintendo has planned it’s going to be a fun time for fans and developers alike. I didn’t see anything on Snow Brothers, one of my favorite NES games so the presentation wasn’t perfect but it was nearly there. All in all, I really enjoyed the presentation and I'm very eager to see where the system can take us. It's a great time to be a Nintendo fan!